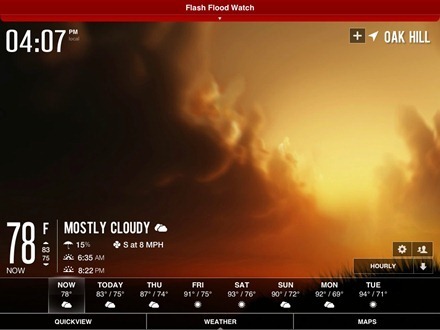 The Weather HD iPad app has been updated this week – and renamed. The app is now called Clear Day, and it’s still got the most gorgeous UI of any iPad weather app. Introducing new major release of Weather HD – now called Clear Day™. Clear Day 2.5 introduces new layout that provides more space to watch beautiful weather videos, while providing all weather information at your tips. In addition, this new version supports native integration with Facebook as well as the ability to share weather screen shots in your Facebook feed. To activate the new layout, enable Settings > Layout > New Layout. Clear Day, the new name of Weather HD, was chosen to indicate that even if weather is gloomy and stormy, a vivid soothing presentation of the weather forecast would provide the user with a sensational and clear-day-like experience full of hope. The new layout is nice, putting even more focus on the striking weather videos that have always been one of the app’s top features. This has been my favorite iPad weather app for years now, and is one of the selections in our list of the Best iPad Apps of 2012. Here’s an App Store link for Clear Day; it’s priced at $1.99.